We departed Nevis early - about 6:30 AM from Nevis to Montserrat. Montserrat used to be just another very beautiful island with a typical British West Indies population, and lots of tourists. But, in the mid-1990s it's volcano went off and the southern half of the island had to be abandoned. The volcano is still quite active, so we weren't sure if we would stop there or not. Wind was pretty much on the nose, so we motored 1/3 of the way, sailed maybe a bit more than 1/3 of the way in the middle, and then motored the rest of the way in. Once we passed Rodonda the waves were a bit higher - about 5-7 feet, so we reduced speed to about 5.2 knots to keep from bashing too much. 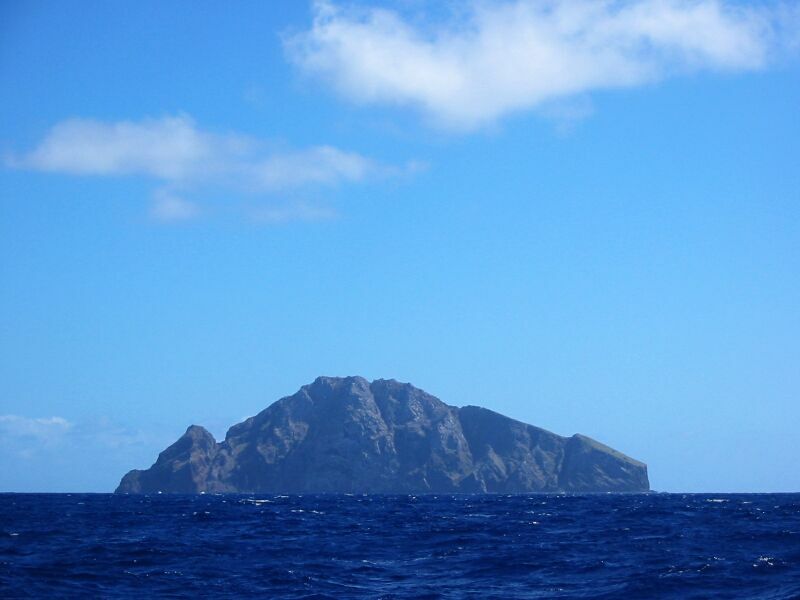 Rodonda is just a big rock, an uninhabited island, half-way between Nevis and Montserrat, like the book said. The island was claimed by some King in Europe a few decades ago so he could give his son a kingdom. They came to the island and held a coronation, and from that point it was known as the kingdom of Rodonda. The "King" got invited as royalty to events in Europe, but his main passion/career was as a writer. When he got old, he had no son, so he bequeathed the royal seat to another writer. The new King did the same thing, and I guess it will continue to be a "writer's" "kingdom". The island defintely doesn't appear habitable. 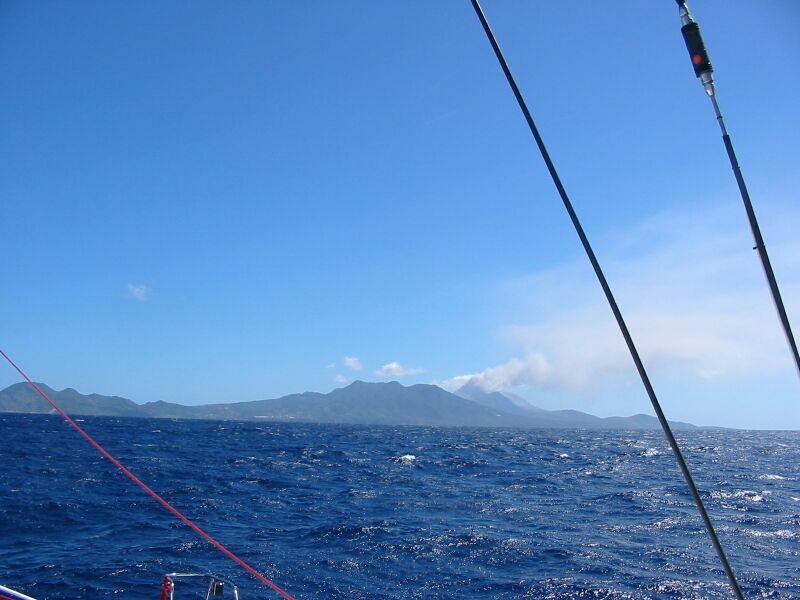 As we got closer to Montserrat, we could see the ashes from the volcano spewing and it appeared they were not going to go over the anchorage. So we decided to continue to Montserrat instead of going on to Antigua. We would try and do a tour of the island right away, and leave first thing the next morning as high seas were forecasted to be headed into the area due to a big storm in the North Atlantic. We arrived in Little Bay at about 2:00 PM. After anchoring, we quickly got our dinghy down and all of us went ashore. It took about 35 minutes to do customs - lots of paperwork. What a pain. We cleared out for early the next morning. We walked through the commercial dock gate and at the BitterEnd bar we met the proprietor who called us a taxi. The proprietor told us his wife is with the government in charge of education. He gave us a local paper to read and let the kids watch his television while we waited for the taxi driver. Geogie White, our taxi driver, told us he would give us a full tour, let us see the volcano after sunset and take us to dinner at 7:00 PM and then pick us up and take us back. All for $100 US. Not bad really. We first went to the east side and saw the volcano while overlooking the ruined airport. We saw HUGE house-sized boulders being spit out of the new highest peak of the island - the volcanic dome. Georgie said it is now 3700 feet and growing. While it is growing, it has been eating away at the nearby mountains which used to be taller. Soon they may have a mountain taller than St. Kitt's tallest peak - 3722'. Maybe it was taller while we were there. The new "mountain" is actually a volcanic dome. The locals are actually hoping the dome will collapse or burst so it will release the pressure capped by the dome. This will most likely result in a long period of relative quiet and they could re-occupy the southern portion of the island. 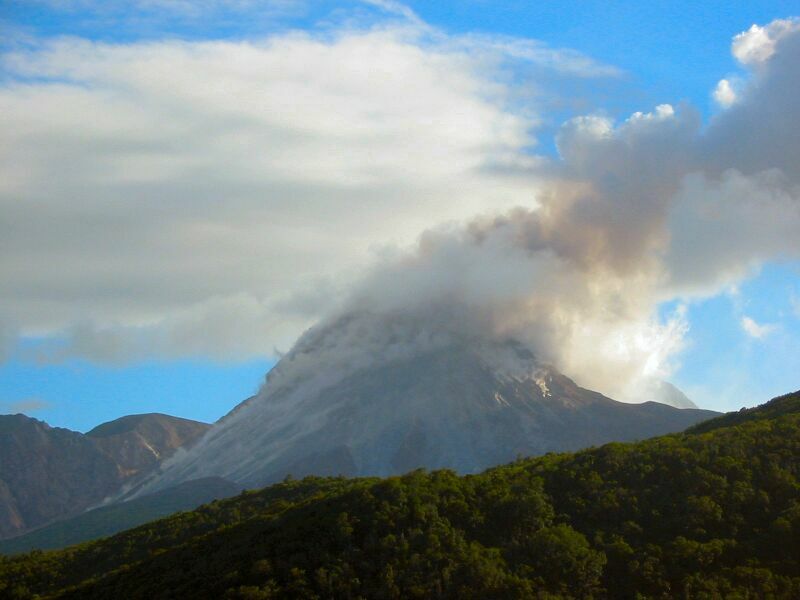 Georgie said the volcano was quite active, more active than it was two weeks earlier when we heard warnings to stay away over the weather net. 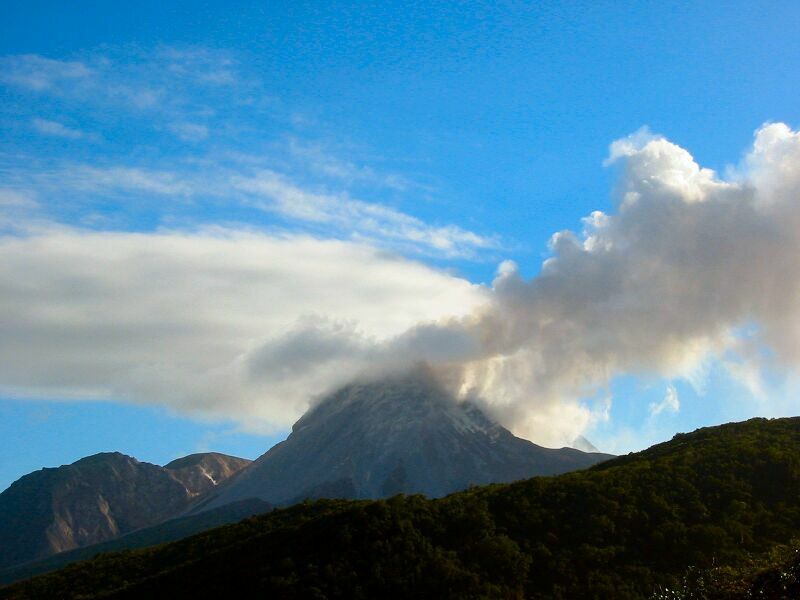 As each boulder came out, it left a streak of steam and smoke along the side of the mountain. Several boulders would come down at once. Then there would be a break and the smoke would blow away. Here are some pictures of the side of the volcano before and after several large boulders fell down the side. Notice the streams of smoke and steam left by the blazing boulders. Georgie described for us, as an actual witness of the events, how the southern portion of the island was evacuated in the mid-1990s. The capitol, Plymoth was destroyed in 1995. Then on June 9th, 1997 the volcano erupted in earnest. One town on the east side was completely erased on that day. Fortunately, only 19 people were known to have been killed. They were the ones who chose not to evacuate. The north side of the island was safe as a large mountain shields the north side from the destructive power of the volcano. You can still see numerous farm houses, stores, hotels and beautiful island mansions which appear intact. But, the whole area is evacuated because of the risk. 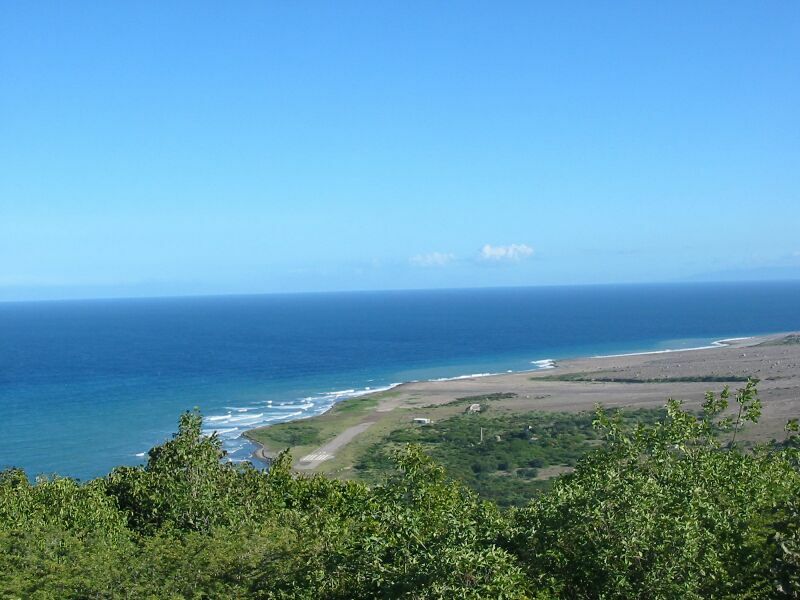 One of the things which went, was the Montserrat International Airport. You can see the airport was overrun and the town south of it was erased. This volcano is not the kind which explodes and spews molten lava. Instead it sends flaming boulders down the sides, ash into the air, and pyroclastic flow - poisonous gas and ash in rivers of flow mostly subterranean - all the way to the sea. It's still very hot, but different from volcanoes with surface lava. The southern part of the island was formerly the primary location of the population. Since the southern part was evacuated, almost the entire population and infrastructure had to be relocated. 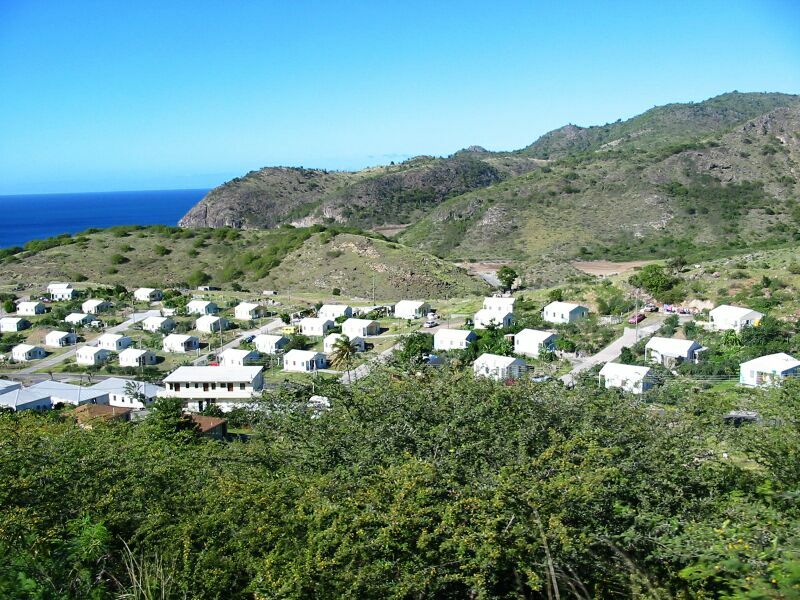 About 2/3rds of the population migrated to other islands or back to the U.K. (the parent country of Montserrat). The rest had to build new homes with the help of the government and assistance from many other countries. Georgie drove us around their new homes, businesses, and government buildings all over the northern island. 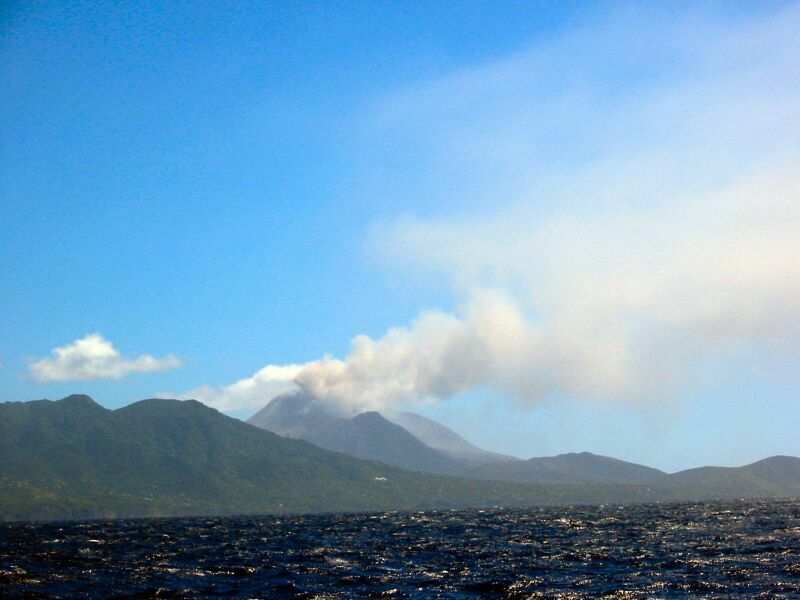 Its not surprising that the island's main industry at the moment is construction, followed by Volcano tourism. We got to see the volcano from the west side of the island from the newly built volcano observatory (in the process of opening this month). We watched the boudlers falling just after the sun set. It was even more amazing as you could see the flames as the boulders were spewed out the top of the volcano and as they came crashing down its sides. Unfortunately, the night shots didn't turn out well with the camera. We had a nice dinner at a small restaurant at 7 PM and then returned by taxi back to the port. We took our dinghy back out to the boat and got to bed by 9 PM. Frank got up the next morning before dawn, and discovered during the night the lack of wind allowed the ashes from the volcano to lay a light layer of ash all over PatiCat. Bummer. Thankfully we have a salt water deck wash system and we all got up and spent time hosing down and using buckets to clean PatiCat and the dinghy. Thanks to no limit on the water, it only took us about an hour, and we quickly left the area before more ash fell on the boat. Fortunately, on our way to Antigua we managed to sail through some small rain squalls and got the rest of the boat rinsed off with fresh water this time. It was only a 30 mile sail to Antigua, and we arrived by noon. We actually sailed around a bit to make more water before going into the harbour. A write-up on Antigua will be forthcoming in a future update.